My first bottle of this a couple of years back was a bit of a let down truth be told. I was all prepped for this intense smoky, peat rich bomb and what I got was a pleasant yet slightly underwhelming peaty whisky that seemed out of kilter with others' experiences. I've since tried this in bars and enjoyed it more and so when I saw a bottle for £39 recently I thought, well, it would be rude not to! This bottle has been open just over a week and review is without water. Nose - A strong blast of iodine soaked peat with a sugary sweetness sitting stoically amidst the smoke. There's some coastal notes, salt (a touch) and seaweed, hints of sherry - brown sugar and some red fruits. Liquorice torpedoes and diesel. It puts me in mind of being in an old fashioned sweet shop as a kid, standing over the penny sweet tray while peat smoke from the fire inside seeps into the shop front. Very appealing this time around I must say. Taste - Smoky, dry, sweet and sour all at once. This is quite complex and the mouthfeel is decidedly silky - it seemed 'thinner' last time round. The iodine and diesel notes sing loudly but they are backed all the way with the lovely integrated sweetness. It starts to turn much dryer as it develops and some bitter tannins creep in. Finish - The finish is quite long and seems to almost have two parts: as the tannins start to emerge more you are left with a dry, slightly bitter taste. This is then complimented by an upsurge of smoke that really lifts the tail (and one's spirits). So, I am now convinced my last bottle was below par. There was certainly a lot of chatter at the time that the quality was wavering. There's a great review on YT by Horst and his son that compares a recent bottle with one from 10 years ago that's worth a look. This bottle has been hard to put down in a way a whisky hasn't done for me in some time. It's also nice to return to a whisky and find it better than last time - not something I've had much luck with this last year. The bitterness at the end does hamper it a tad but overall this is a great whisky and worthy of its reputation for sure. Ron, I salute you! The Lagavulin 16 is a classic that should be in every single bar. If your bottle is empty, run straight to the store to replace it, for it is an affordable standard whisky that raises the bar very high. I will gladly try this bottlings from 23rd December 2015, with thanks to Pat for the sample. The nose is powerful and soft at the same time with loads of medicinal elements and peat, sea salt and more maritime elements. I am transported straight to the rocky coast of Islay, where a feisty wind almost blows me from my socks. But there is also a doused wood fire, vanilla, caramel and oranges on this lovely, warm nose. It rolls silky soft accross the tongue, caressing your taste buds with surprisingly sweet notes from caramel, oranges and dark fruit. Obviously some wonderful, classic Lagavulin traits kick in as well: iodine, salt, peat and smoke. This continues in the medium long finish. Ah… a classic, like I said. More sherry influence than I remember. And indeed: this is a must-have. That reminds me… off to the store! This will be nowhere near as amazing as @BDevries review. But i will do my best and try to mix some metaphores into my usual boring analytical reviews. Bottle has been opened almost a week and is 90% full. This is my third glass from this bottle. Nose: A dancing nose. It's as if sweet and smoke are on a see-saw both going back and forth. Sweet...smoke...sweet...smoke...also get sea salt and oddly enough powdered dish detergent. Palate: What the hell. Where is the peat bomb I was expecting? No smoke to be found. It's lightly sweet. And boring. Not much going on. The body is nice and oily, albiet thin. Just weak. Hmm. Finish: Ah, there is the smoke again. Welcome back dear friend. Finish is medium-long with smokey BBQ balanced with sweet oily plums and raisins. Much better. Overall: I had high expectations for this so maybe that's why I'm a bit dissapointed. The flavors seemed subdued and this really isn't the big islay peat bomb i was expecting. For something peaty I think this bottle of lag16 sits well below the Uigedail I recently had and even Talisker 10 and Laphroig quarter cask. Wonderful nose, enjoyable finish, but a thin, sweet palate with no smoke? Maybe I'm crazy...who knows. I'll stick with Laphroig quarter cask and Talisker 10 when I want a peat fix. To chime in, I have to agree with Victor. Laga16 has declined since I first started tasting it and it's never recovered. Day and night change. I too find it sweat and rather dull. What a shame. Old bottling, are powerful stuff. Intense smoke, tar, brine, peat. Today's Lagavulin tastes like a peated Glenfiddich 12. @casualtorture You mention Talisker, and I agree. Today's Tali 10 can beat a Laga 16 hands down. It didn't used to be this way, Lagavulin 16 would outclass a Talisker easily once upon a time. @casualtorture, you have to write an honest review. Quite a few Connosr members have never had a "meh" Lagavulin 16 yo. For these individuals Lagavulin 16 still has a sterling reputation. While I have had 94 point Lagavulin 16 yo, I have also had an entire bottle of it which shares much similarity to your own. I would never intentionally buy another bottle like that one again. I do not trust the brand anymore, and would be unlikely to take the chance of buying an untasted batch of Lagavulin 16 yo in the future. I would love to have one or more bottles of the Lagavulin 16 yo I tasted 7 years ago, though. NOSE: complex Demerara sugar sweetness with that lovely bacon smokiness and a touch of peat. Dried fruit. A tiny splash of water tones down the smoke and reveals some sweet herbal, tarragon notes. TASTE: explosion of flavor. Rich, almost sherry-like sweet with undertones of peat which really is not that prominent. It's accompanying the experience, not leading it. There's a touch of caramel closer to the finish. FINISH: the finish alone is worth the candle. It's truly very big and long and warming with lovely dried fruit, burned wood and iodine. I really didn't get much smoke and peat, as was promised. The bottle had been probably open for ages at that place. Nevertheless, it was a very lovely dram with a beautiful, beautiful finish which I've really fallen for. The most dominant note throughout all the senses here is this Demerara sugar which is infused with smoke, peat, herbal notes, dried fruit, and caramel. My bottle started out mild peat, little bit of smoke and fruity rich very similar to what you describe move on 2 weeks and. Dirty oily smoky and mouth coating this is a total peat monster with a rich fruit underpinning. Spicy/peppery when held for any length of time on the tongue and a finish that goes on until tomorrow. When I first opened this I thought I understood why so many members had a downer on the more recent batches but how that has changed now. This is my favourite Islay Standard bottling it blows the socks off Ardbeg and Laphroaig my caveat being I have only had one batch if the rumours are true I got lucky. Never had a Batch variation in Laphroaig 10 a little with Ardbeg10 but if I did not get the bruiser I am currently sipping I would be devastated. Pete1969 mind you, I tasted that whisky in a bar with load music and quite a bit of distraction. I find that unless it's a specialized whisky club or your own bottle - you can't be 100% sure of what this or that whisky is really worth. So although it is significantly more expensive , if you are to be objective, you just have to buy a bottle and revisit if for at least a few weeks to be able to make any kind of judgement. For me Ardbeg 10 and Laphroaig QC are the best Islay can offer for a reasonably good price. I started off not really liking peat. To the point that this was the one whisky I needed ice for. But after half a bottle of drinking this Scotch with ice, I had been converted to that peaty goodness and I must say, it is truly delicious. The nose of this whisky is hard to describe because of the overwhelming amount of peat, but on the tongue it is a savory treat that is overflowing with smoky flavor that reminds me of jerky. There is something truly special about this Scotch despite the lack of "refinement" of its profile compared to those finished in Sherry casks and the like. To me this Scotch may not have the subtle intricacies of others but it makes up for it in sheer amount of body and how full it is in flavor. There is no better whisky to enjoy by a fire while smoking a cigar. This was my first bottle of such heavily peated whisky, not my first introduction to peat at all. There are plenty of Scotches with a mild peat in the profile. I have also had Laphraoig and some others and yes, Lagavulin is more mature. However, my ability to pick out distinct aromas and flavors like I can in a Macallan, Hibiki, or Glendronach is fairly nonexistent with this whisky. That's not to say those subtleties aren't there, I can tell its a fantastically well rounded dram. I only meant that relative to my usual choice in whiskies it seems more of a rock concert than a symphony to make a poor analogy. Nice. It sounds like this was your first peaty bottle, but was it also the first peaty whisky you ever had, period? Lagavulin 16 is usually considered one of the most refined peaters, so I wonder how you perceived it relative to its Islay brethren. Here it, the world’s first-ever, never-before conceived, executed, or documented review of Lagavulin 16 fresh on the heels of a vasectomy. Yep, definitely the first. My two little girls will be the limit of my contribution to world’s overpopulation. This morning, I went under the knife. This evening, I nurse my pain by squatting on a bag of frozen peas and cradling a snifter of Lagavulin 16. There are a million reviews of Lagavulin 16 around, so I won’t bother with any flavor lists or anything. I mostly want to point out that this old dog can still hunt. I had been in the deep end of cask strength Islay whiskies for a while, and I feared that Lagavulin 16 would seem pale and watery when I came back to it this year. Nope! I was pleasantly surprised to find that it still holds up. It’s tasty, and—especially—it’s FRESH. Freshness is one of my favorite qualities in a whisky. I love to feel like I’m getting a lungful of an ocean breeze never before breathed by another soul. Lagavulin 16 delivers that. It’s not powerful, but it is very nice. And a little Lagavulin anecdote: Unlike many maltheads, Lagavulin 16 was not my gateway to peat or to single malts in general. Thanks to its high price, I steered clear of it for a long time, all the way until I found myself at Lagavulin during the Feis Ile in 2010. My wife and I sat on that grassy bluff overlooking the little bay and the ruins of Dunyvaig Castle, I drinking my first-ever Lagavulin (and hers, too—since she doesn’t drink liquor), and she trying to convince me that it was the right time to have our first baby. Little did we know, she was already pregnant. Also surprising: Only one of these three pages includes a Bruichladdich Rocks joke. Recently purchased a bottle of 16 and this Lagavulin has serious shortcomings compared to previous bottling. Nose: Sweet wood, very little smoke, anise, brine. Gone is the tar/freshly paved road, the burnt leaves, the damp saltiness, the strong smoke. Taste: Very sweet. Too sweet for a Lagavulin. The peat is in the background. Smoke is also very tamed and only present in glimpses. Overall the sweet wood notes dominate with slight anise and bitters. What a shame, gone is the big peat and everything that makes Lagavulin great. Finish: Smoke comes out here but it's too late of an appearance to save the show. Overall I'm rather disappointed in this malt. They've taken a good complex scotch and made it rather one dimensional with a wood sweetness dominating this particular bottle. This bottle of Lagavulin is just not how I remember this malt being. Initially I thought it was because the bottle was new. But I've kept coming back to it to see if oxidation improved it. Nothing has changed and the bottle is now around half full. @masterj, this conversation has been going on on Connosr for a long time, 2 or 3 years, at least. I and others have had GREAT Lagavulin 16 in the past, but not in very recent years. Others are still delighted with it. Who knows how many of those still delighted are drinking from the same batches as those of us who are not delighted by some recent batches? Lagavulin 16 is on a great sale now here where I live, but I wouldn't dream of buying another bottle of Lag 16 without tasting from a bottle from that particular batch first. My current bottle of Lagavulin 16 is just so damned boring that I would never want to repeat it. @victor Boring would be a good way to describe it. The bottle I have just seems bland. If I gave a dram to someone tasting it for the first time they might enjoy it thoroughly but most of the classic tastes and smells associated with it are gone. Especially on the nose you can tell just by the smell, something is missing here. It doesn't even smell like Lagavulin 16 of a few yrs ago. I've given drams of this bottle ample time to breath, 2-3hrs, and it just doesn't improve. I've added water and even then nothing new emerges. It's almost as if it has been made one dimensional by design. Lagavulin 16 yr is true it's region and it's name. This is a genuine scotch with rich organic flavors for which you do not need to send out a search party. It is as though all of the flavors are on a plate sitting in front of you and are easily identifiable. Peat starts the nose, then smooth transitions to and through various sweet candy flavors. Not convenient store candy, but freshly made candy-store candies... Subtle, sweet dry flavors make up the body, and smooth transitions through a long, lingering, sweet and smokey, finish. Nose: Out of the bottle it’s rather closed, meaty smoke and salt. With a little time some complexity starts to become apparent, intense peat smoke followed by a hint of vanilla and toffee. With a few drops of water (no more!) it really opens up. The sweet smoke makes some space for a wonderful creamy caramel vanilla surprising in its intensity. With some time I’m starting to notice a pleasant menthol thread in this fascinating nose. Palate: Mouth coating with a sweet caramel vanilla arrival followed quickly by a tongue tingling spiciness and the signature Lagavulin peat. Finish: Warmth in the throat, plenty of peat smoke, subtle sweetness and a lingering saltiness. I started to experience some palate fade before the end of my exploration and so used some of the clear memories of my first ever taste a few weeks back. Without wishing to bang on about this old chesnut, the score would be dangerously close to the limit if this expression was non-chill filtered, natural colour and bottled at higher strength. Hi NAV26, the bottle code of mine is L4302CM000 and on the line below 08679900. Being a beginner I have yet to come to grips with bottle numbers and batches unless it's categorically stated on the label. @phil73805, do you have any bottle code, I just picked a couple of bottles (L 4 244) up in Conakry and wanted to know how they might compare to the bottle in your review? I originally wrote these notes for my Norwegian review back in September last year, but never quite got around to translate it for Connosr. Nose: Peat, a clear touch of malt, leather and some sweet, fruity sherry. Oak and a hint of salt. The peat is consistent and controlled, and never dominating. Taste: This has an oily mouth feel, with a calm arrival of flavours, and a pleasant alcoholic sting. The intensity of the peat here is gradually increasing. Smoke, roasted coffee, spearmint and sherry. Finish: Surprisingly pleasant and soft. Spearmint, liquorice and oak. Peppery warmth, smokey flavours evolving towards sweet smoke. For me, this is elegance and control in a bottle. This is the closest Ive tried to a perfect peaty malt. Lagavulin would definitely get into the category of bonfire, leather, iodine, but also a raisin and a toasted pistachio marrying in your palate. It's one of the peat monsters; I've gone through Talisker, Ardbeg, Laphroaig, and all of them have their own distinctive element. But Lagavulin stands out with the perfect combination of ABV, strong peat, rich, almost weird sweetness and smooth yet complex finish. I tasted a glass a few days ago. Yes, it's still quite nice. This said, it used to be better and much less expensive. Ah, those were the good ole days; when drinkers in the US were not turned on to scotch whisky and instead were content with their vodka and gin. I miss being able to walk into my neighborhood liquor store and buy a bottle of Pappy's right off the shelf. Of course, back then good scotch whisky was hard to come by in Oregon. The liquor control commission didn't try to get very many interesting bottles into the state since demand was low. Ah, but a trip to Scotland back in the 1990's was like visiting Valhalla when it came to the wonderful bottles one could stumble across there, even in the lowlands. They’ve not changed the presentation of this whisky in my memory. A regal dark green box, dusky green bottle, understated but assured, as consistent as the contents. Massively smoky on the nose with some sweetness. The sweetness seems to have a tree resin quality, while the smoke is the main show with whiffs of kippers, sea weed and phenolic peat smoke. The taste is remarkable with a huge array of flavours overwhelming the palate. It takes time to explore but there is smoke (of course), some bitter malty hints that have been likened to Lap sang tea, peat, coffee, sherry, sea weed, woody resins and bitter chocolate. The mouth feel is rich and full but for a south shore Islay it lacks the mouth puckering phenolic burn, peaty yes but mellow with all the flavours. The bitter flavours come to the fore through the finish but it’s a satisfying long end. This whisky blew my socks off years ago and it still surprises me. Never disappointing. Mct, they are two quite different beasts. I consider the Lagavulin to be much peatier than the Highland Park. I bought this bottle with high expectations, after reading lots of consensual positive comments about its strong, smoky and powerful flavours. I have tasted it several times since, and each tasting confirms my opinion. For a first review in Connosr, it might be a little bit severe and polemic one, as my senses disagree quite absolutely from 92% of the Connosr malt reviewers. (Just after writing this review, I looked at the other reviews here: only 5 reviewers have given worse ratings than I did - but 2 of them say that they love it, and 67 have given higher ones.) I admit this may be the result of my own taste and personal preferences. Nose. Quite restrained, but after a (too) long time, it opens. Round and enveloping, but not as rich and complex as I would expect. Caramel (explicitly added by the distillery - oh, I don't like it! ), some honey notes, smoky peat prevail to the extent that other fragrances are squashed. Palate. Toffee and sweet almond oil smoothly caresse the palate, the oily texture dominates, but again I failed to clearly identify something more complex than this sensation of sugar and sweets. Finish. Short, with pleasant notes of coffee, white chocolate and some bitter almond. Part of what remains after, though, is an unpleasant memory of one of those cough syrups I sometimes take in the winter. Fortunately not as unpleasant as them. This whisky is hard to approach when one is looking for complexity. It is a little bit podgy, clumsy. Would be easier to taste after a long walk under battering rain, as it brings comfort and warm: I would not recommend it for other purposes, as it is a worth-to-try but probably overpriced whisky. My Laga 16 fell short of something to distinguish it from the others and the lack of smoke and peat in my bottle was quite a disappointment. I felt like I was drinking slightly peaty water to be honest. Honesty goes a long way. I recommend you try Lagavulin Distiller's edition. I have the 2012 open and it's amazing. For what it's worth, the 16 used to be better. I would still rank it higher than you have here, but it's slipped down a few notches on my ratings peg board. I didn't start out with typical starter whisky. I have yet to even taste a single drop of Fiddich, even after posting a sizeable collection. I traveled to Scotland, and asked for something campfire-ish. Laphroaig was my real dram. Next dinner I asked for similar to Laphroaig. I got the Lag16. All the smooth, silky smoke, and toasted flavors. After I've tried several new things, I like to come back to this bench mark to see where my taste buds have traveled, and confirm where home is. I'm finally looking into lighter whisky, and my newest taste has been a revelation. But I suspect Lagavulin will be calling me home again, and again and again. That's definitely something I hope to pick up if I ever get the chance. I can justify getting extra spendy for that. I need to try the 12 year old as well, just to round out my Lagavulin experience. A viscous, tangy, floral, smoky and smooth whisky with a slightly dry aftertaste with a hint of seaweed. My tasting buddy said it reminded him of Christingles! This is the Laga 16’s 70th review on this site, so I’m not sure if I’ve got anything new to say on the subject. I often try to offer up a fresh perspective on a whisky, but not this time. This time I’m more than happy to join the symphony of voices out there offering up their praise and endorsement. There’s a reason this is popular, and that’s because this whisky is an all-time great. Simple as that. Nose: Peat, sherry, and salt. The peat is big, but restrained. The sherry is fruity, sweet, and rich. I get blood oranges, earl grey tea, rooibos tea, leather, spearmint, eucalyptus, charcoal, and oak. Palate: Medium bodied, with an easy, paced arrival. Peat, smoke, sherry, spearmint, rooibos tea, cigar, eucalyptus, throat lozenges, tangerine, smoked meat, dark chocolate, and mellow roast coffee. Finish: Long, effortless, smooth, and silky. Spearmint becomes peppermint (Mentos?). Charred oak, campfire smoke, pastrami, sherry, licorice, almonds, Irish coffee, Amarula liqueur, and some soft, lovely oak. What a classic. There’s something about the Lagavulin house style that elevates it over its Islay brethren. The beauty lies in the controlled quality of the peat presentation. While it could be described as a whisky with ‘big flavour,’ there’s no ‘attack,’ or ‘peaty blast.’ No, this is controlled, paced, and measured. ‘Smooth’ isn’t always a trait I look for or care about in a whisky, but it works here. For something so rich and flavourful, it’s also very graceful and effortless. This stuff is strength, sophistication, and finesse in a bottle. I'll look forward to trying this one again soon, too. You got more mint than I remember; but sometimes for me, iodine does come across as mint, somehow. I agree about the agreeably tamed peat; have you had the chance to compare the 12yo? So... any plans for review #100? I won't review this whisky, cause I only had my first and only dram on my little getaway here in Key West. But I gotta tell you, you hit it right on the nail. Could not describe it any better than that. I'm not too thrilled with Isla whiskies, except Bunnahabhain 12, but this is very drinkable. No attack on the peat, like u said. I still won't buy it for personal consumption ,but very good indeed. As the title states this reminds of smokey tea, the flavors and the smells are just moody and in my opinion perfect. Nose: Spice, earl grey tea, peat, smoke, iodine, sherry notes, berries. Palate: Cask shows its head in this dram, spice, peat,smoke, iodine, earl grey, moody sherry, berries, slight hint of oysters. Finish: Smoke, tea leaves, dark fruits now show, berries, brine is there in the end. Very good, I have heard that in the 80's Lagavulin was better and i do not doubt that as the west over consumes there will continue to be a drop in quality. I would compare this to Ardbeg 10 with Laphroaig Triple Wood added to it, at the same time there is nothing like this i have had yet. If you have not grabbed a bottle i understand the cost is up there, at my local costco it was around 74.00 USD after tax which is cheap because at my local bevmo it cost 79.99 without tax. I don't have much to contribute to the science of Lagavulin-tasting. I'm sure the world does not need another review describing the peaty iodine blast of the nose or the smoky finish. But in the interests of attempting to say something, here is an observation. I am just getting to the end of my bottle, which I purchased some 3-4 years ago. There has been some chance for oxidation although it was probably over half full for about 60% of the time I had it. While I have been enjoying the final glasses, I've also occasionally been out and about and enjoyed a glass off a "fresher" bottle, since I'll often opt for Lagavulin or Talisker if it's on offer. What I notice is that my older bottle loses some of the aggression of the nose, and that sweeter notes appear much more readily. The smoke, the peat, and the iodine are all still there, but it seems milder, particularly on the nose, almost like my Talisker 10. I compared it to a newly opened Laggy 12 the other night, and it was like candy in comparison :). What I would take from this is that Lagavulin is not a bottle to fear drinking too slowly. In my case it seems to have revealed a different character as it went. Maybe oxidation is the death of a milder whisky, but in this case it just turns into something different, and no less enjoyable. The rating is for Lagavulin 16 in general. We all know it's good, but I wanted to try and find something to contribute before finishing the bottle. The L3183 bottle I have is the worst Lagavulin I've ever had, and close to the worst single malt (which was Jura 10). Very disappointing as I love Laga in all versions! Has the nose of saddle leather, but tastes like licking the inside of pleather shoes that have been worn without socks on a warm summer day. Seriously! I've tried letting it sit for extended periods, but it hasn't helped. Please tell me the rest of 2013 bottles aren't like this! The previous 2012 was wonderful, one of the best I've had. An example of how not all reviews have to include nosing-and-tasting notes to be good reviews. You're right--most of us here know this one well. Nevertheless, you've provided some fine observations on how bottle aging affects the much-beloved Laga 16. I can't help being very impressed with this bottle. It looks like it's a hundred years old with the washed out colours, old style text. Even the top, oblong, part of the label is reminiscent of a nautical window. The nose doesn't begin to hint at the smoke to come. Mostly I just smell alcohol. The taste is quite dry and a bit salty, but it's the nose that has the huge smoke kick in it. But it's not over the top; it's weighty, but it's right. One thing that I find pretty consistent is the number of folks here enjoying this fine dram. It arguably sets the standard for smokey/peated single malts. Glad you enjoyed it as well. I can see why it was chosen as the (Diageo?) Islay Classic Malt. Much more elegant than Ardbeg, Bowmore, Caol Isla or - god help us all - Laphroaig. Though not my GO-TO Dram becasue of price, this is by far the best on the market... The most complex Single malt their is.. Whoosh this dram around your mouth and you'll get shivers down your spine. It has layers and layers of Sherry, oakiness, Peat smokiness, fruity sweetness, creamy vanilla, and a spicy finish that stays and stays, and stays.. I can't say it enough... THE BEST THERE IS! @Fubar1367, don't worry about it. All scoring is subjective, and really serves a boost in conjunction with tasting notes. Some things inspire an emotional response and score. I'll admit to having a few like that -- a few scores that, if I could re-do them, I would. They just struck a particular cord with me that I gave them extremely high scores (e.g. my first few pours of Compass Box Flaming Heart 10th Anniversary.) Some people score down their tasting notes to account for that and convey a sense of perspicacity. With experience, you'll find your zone and your comfort level, and others will have a sense of how to interpret your notes if they so choose. It happens with most people; I think that a few bloggers in the past few months highlighted some of their first reviews to show just how much their palate has changed, and how they've moved on the journey through whiskies. I applaud them for doing so. Rather than think of any review, set of tasting notes, or score as authoritative (yours or others'), think of them as a snapshot of a person's perspective at a particular point on their journey. Most of all, just enjoy it! Lagavulin and I have a sordid history. The very first tasting notes I ever wrote down involved Lagavulin 16yo in the summer of 2001. I had just bought my first bottle of Glenmorangie 10yo and to better get to know scotch I bought that old six pack “Classic Malt” set of 50mL miniatures. I am sure you are familiar with those 6 bottles. I can still remember my first taste of Talisker 10yo . . . I thought it was horrible. So I wrote down something simple to that effect. Then I tried Lagavulin 16yo, and my tasting notes from that night simply read: NEVER BUY! Fast-forward a few years. Highland Park turns me on to peat. I remember that experience with Talisker and Lagavulin, and I ended up with a bottle. However, I quickly discovered Ardbeg and Laphroaig. And Lagavulin has really always played 3rd fiddle to Ardbeg and Laphroaig in my heart partly because of price, partly because of Diageo, and partly because I just tend to like younger whisky. 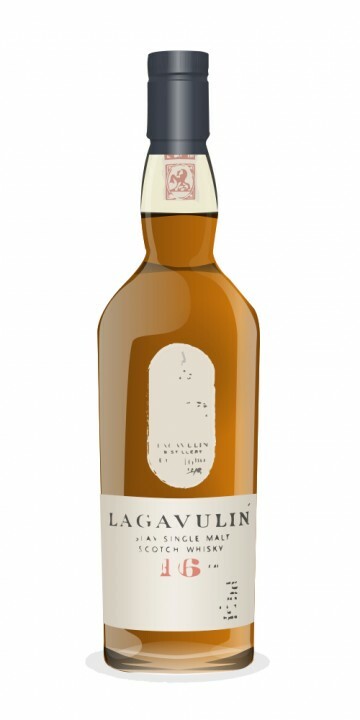 However, Lagavulin is my wife’s favorite single malt scotch. She almost never, ever drinks the stuff . . . but if you were to ask her that is what she would say. Further, one of her favorite cocktails is a Blue Stormy Martini – a gin martini (2 oz Plymouth Gin, with ½ oz Lagavulin 16yo instead of Vermouth, and a blue cheese stuffed olive). So needless to say I have a great excuse to always keep a bottle of Lagavulin 16yo around. Sadly, it tends to stay around with lots of air for quite a while. I bought this bottle in the summer of 2011. And I just finished it off the other week. Remarkably, it has stayed consistent great over the 2 years it has been opened. The following is a compilation of several tasting notes over the course of two years. Nose: Rich and inviting peat. This is smooth elegance in a glass. A woodsy peat greets your nose. Then comes a rich sweetness. It is a very complex and mellow sweetness like over ripe plumbs or dates. It is a very low tone sweetness. There is a velvet and purple quality to this nose. I would swear that there are a few sherry casks in this malt. After some time the peat all but seems to disappear into the background woods with the sweet sherry fruit coming to the fore. Behind that you can easily pick out leather, pine needles, pine cones, dried bark, and moss. Really one of the great single malt noses. Lagavulin really hits where it needs to at this age statement: refined elegance, complexity, and power. With more time the peat almost disappears completely. Taste: Very balanced on the tongue with semi-sweet peat. Some leather, earth, armchair, smoke, and peat. Lovely and well integrated. There is some vegetable matter in the background. Nothing off or bitter as it sits on the tongue. Quite lovely actually. Finish: A big intake of breath . . . then comes the wave of peat smoke and fire. The sea salt sears your mouth eliminating any trace of resistance. Beautiful and lovely. Not the biggest finish of the big 3, but still lovely and long. There is a hint of something bitter . . . tree bark? . . . but it is replaced by other mellowing agents of sweet peat, salt, leather . . . It is like liking an old barrel that has been sitting in a smoking den: tons of ash, wood, peat, and dirt. Leather mingles with seaweed and pencil shavings. This is an Oxford professor’s drink. Medium long finish. Complexity, Balance: This is one of those amazing malts that seem to deftly walk a line between power and elegance; smoothness and ferocity; sweet and bitter: subdued and intense. And it does so brilliantly. It is not only one of the most complex malts out there, but also one of the most balanced. The peat and smoke play well into the mystery of the earth, wood, fire, sweet chocolate, maple, sea salt, and leather. It is all a huge dancing web of mystery and beauty. It really is near the top of complexity in my book (as far as a readily obtainable whisky goes). And the balance is astounding considering that this particular bottle has been at less then half full for well over a year. It almost lost its footing on the finish but it totally redeemed itself. Aesthetic experience: I love this bottle. I love that it hasn’t changed (much) since it came out in 1988. Easily my favorite bottle and label style of a whisky. The age is wonderfully classic as is the little Lagavulin seal over the cork. It is just a classic in my book. Even the 43% ABV seems to work here . . . which kind of shocks me. This is a bottle you buy, pour, and repeat. Conclusion: I hear that the peat levels will drop in the near future – saddening indeed. Further, I hear that there will be fewer sherry casks – more sadness. This is just that perfect mix for me. Most nights I want something big bold and powerful – which really is not the game here. This is something for when you want velvet power and mellowed extravagance. I tasted this bottle with paper in hand on 5 occasions over 2 years. It always scored between 93-95. But mostly spot on at 94 - hence this bottle score. I just purchased a replacement for this bottle . . . we will see how it lives up to this great example. Thank you for the kind words. It is a rather long review . . . I hope some people find it helpful. My working theory on the numbers is that the L0 means "year 2010." The next three numbers (in this case "348") are the day. If my theory is correct then this was bottled on December 14th of 2010. I will say I just opened a new bottle . . . and it isn't as good. Anyway, on to the Lag16. The first experience was at Bar Lafayette in Perth and it was awesome. I had no idea of the batch consistency concept that gets touted around. Had it a few more times out before I finally purchased a bottle myself. This was about two weeks ago and I'm sad to report that there only about a third of the bottle left. I had high expectations upon opening the bottle, but the first few days both the nose and palate was tremendously salty. Water and maybe 20 minutes or so would calm it down but it still wasn't the experience that I had remembered it to be. I found that drinking it from a tumbler instead of a flute shaped vessel helped a lot after this initial disappointment. And now this is probably entirely in my mind as I'm sure my taste buds are not that sophisticated but, keeping it out of the box to expose it to some light felt like it helped it release. Eventually, after about 5 to 7 days my impression of it vastly improved as the salt seemed to fade, and the smokey barbeque that I loved so much about it is coming out. Of all the bars I've been to, all have been recent bottlings with the sailship and "Port Ellen" label so I can't compare it to older batches. Having said that, this is still a very very enjoyably dram, and it's no wonder that I'm polishing it off the quickest out of the two others I have open. Price variations here in Perth is between $85 to $130, which is quite staggering really. At that lower price range, I won't hesitate to have it as a staple on the shelf. I'm about to open a new bottle and I'm crossing my fingers in hope of a salt overload. I love salty whiskies. Oh and I guess the 87 is the average score of my experiences so far. Would've rated it 90 or 90+ if it wasn't for the salt overload after first opening. I seem to be on a bit of a whisky-family trend so will stay with the theme. This is the third of my Islay malts and the one I most looked forward to tasting. It reminds me of an older uncle in a dinner suit. Worldly, experienced, sophisticated but a little slow now and not into late nights. I made notes when I first opened the bottle and again after 3 weeks. The nose seemed the same and I smothered the glass to get wonderful wafts of orange rind smoked with liquorice. I thought of Cointreau and over ripe lemons. Without water I tasted orange peel and candied fruit. Christmas cake mix when the bag is first opened. Big cloves. With a splash the fruit warmed and reminded me of Jaffa's being slowly eaten by the girl next to you in a movie theatre. I tasted ripe plums, strawberries poached in Muscat and something I'll describe as curry and spice at the end. The finish was not as long as I expected and the hints of salty smoke with nutmeg and lemon rind seemed to fade. The Laphroaig QC and Ardbeg 10 remained longer in comparison. It's a smooth, warm and unflappable malt. I would say it is reliable but it is more than that. To bring back the family theme it is an Uncle who will always give you some quality time but will not let you borrow his 2 year old, 3 series BMW. I received an older bottling of Lagavulin 16 from the family of a deceased uncle. The bottle was half empty upon receipt. I know the bottle has been around for several years, but I am not sure how to determine the exact date. I have had Lagavulin 16 on four separate occasions over the last two years, but none could match the richness and complexity of this bottling. Nose: rich, buttery, and soft peat comingles with sweet red fruit and sugar. Palate: matches the nose. Exceptionally smooth. Sweet, buttery arrival on a bed of soft, rich, and subtle peat. FInish: sweet spice emerges for a long, warming finish replete with notes of red fruit and subdued sweet peat. Absolutely fantastic - the best Lagavulin 16 I've had (the others would have scored in the low to mid 80's). I imagine that exposure to air over time helped to subdue the typical bonfire peat of this whisky, but the results are wonderful. I have had this bottle open for a while now, nursing it slowly.. Sometimes I will have a dram regularly, other times other things in the cabinet will take my fancy and we wont see each other for a while. One thing is for sure whenever we are reunited, I am never disappointed. The bottle is getting very low and now it is time for the hardest parts, firstly saying goodbye to the bottle and secondly writing a review. I titled the review 'What can I say' because I feel a bit that way, there a heaps of reviews of this whisky and it has all been covered, this is a seriously good scotch... Smoke, briny, maritime qualities, smooth, just a hint of sweetness and a really long finish I could go on, but just pour me another! I recently had some Lagavulin 16 at a bar, and I enjoyed so much I decided to buy a bottle despite the high price. It is a world of difference from the dram I had at the bar. The nose of the whisky I had at the bar was much more complex, with more oak and sherry, and not so much as a hint of alcohol. It was a little sweeter on the palette, with more oaky vanilla and dried fruits. The nose of this bottle is mostly just smoke, with hints of acetone, and some alcohol. On the palette it is smoke, with some vegetal peat, and faint hints of oak. The body and finish are where I really notice the difference. The dram I had at the bar had a rich oily texture that coated my mouth, and a long, smooth finish that I could even taste hints of after a dram of another whisky. This bottle has a watery consistency, and the finish seems cut short, with smoke and peat quickly and anticlimactically fading to watery alcohol. It reminds me quite a lot of Talisker 10 with a bit more smoke. At $35 cheaper I’d go for the Talisker any day. That being said, expensive whisky rarely lives up to my expectations, and it's not awful. I would rate it higher if it was a fair bit cheaper. Ardbeg 10, Talisker 10, and Laphroaig QC all offer much more bang for my buck. This is the most expensive bottle I've bought to date, and I do feel I bit like I've been had. Seems as if this may of been one of those "bad" batch bottles. Which, really isn't something that should happen. However, according to a few in the scotch community this unfortunately has been happening lately with once, highly regarded malts. Perhaps better luck next time. I have yet to pick up a bottle of this myself! The reviewed bottle was purchased and first opened in early 2011, 2 1/2 years ago. The bottle is currently half full. As I write this Lagavulin 16 yo is the most widely owned bottle among the currently 8600 members of Connosr. As I have found with other whiskies with high phenol or high alcohol content, this whisky has not deteriourated very much over time. @Victor - My latest 750ml bottle of Laga 16 was also a letdown. I've gone through two Diageo Classic Malts gift packs in recent months (with three 200ml bottles of Laga 16, Talisker 10, and Cragganmore 12), and the Lagas in those were superb. (The Taliskers were also better than what's in my 750ml bottle.) They're either using better batches for the gift packs, or the smaller bottles preserve the flavors better. @WhiskyBee, for the producer to use the better product to bait the purchase of the larger, more lacklustre bottles would be a truly cynical thing to do. Let's hope that that is not the case, and that the future will see better large bottles. As for the smaller bottles preserving the flavours better, those are some crappy corks I've seen on my Diageo 200 ml bottles, much worse than the corks on the 750 ml and 700 ml bottles. This was in fact the second single malt I ever had in my life, but 50 malts later probably still my number 1 or at least still in my top 3. With a dram of Lagavulin it all started, something I seem to have in common with a lot of people, as it sold at a reasonable price, a real bang for your buck. Should be in every whisky lover's cabinet. The perfect malt ! Both this one and Talisker 10 had me rate it as repulsive about a month ago when I tried each one at the bar. I gave Talisker 10 another chance last week, and I reviewed it with an improved score. The same goes for this Lag16, whereby it gets bumped way up to an 89 rating from this evening's tasting mission. Very good, but not good enough for me to buy a bottle to take home. It is very smooth, dark in color, and very similar to a Talisker 10 without the excessive sweetness. The bartender agreed with my description. For those of you have been following my saga, I have decided to prolong the agony of having my single malt collection taken away from me by delaying doctor appointments. Since I could not find a bottle of this for sale in Louisiana, I crossed over the Pearl to my favorite bourbon store and voila, they had it. I whipped out the plastic and bought it. As many of you remember, I initially graded this one as repulsive from a newbie standpoint, and then upgraded it from a second chance tasting at a bar. Getting this new puppy home, it was time to do my usual side by side taste comparisons. Needless to say, I increased my initial bar tasting score, and it easily beats out Highland Park 18, Laphroaig 18, and Bowmore 15. No easy task!!!! Dare I say, this is the definitive single malt available for less than $100 US!!! It has everything: subdued peat and sherried sweetness, which is basically all of the best characteristics of a good single malt. The only problem is that my own personal preferences now rates Glenfarclas 17 and Glenkinchie 12 as slightly higher, and just above Aberlour 12. For peat lovers, this one is a no-brainer!!! Where would I start? I could go on and on about Lagavulin 16's greatness. Lagavulin 16 year old was the reason for my whisky madness. Whisky is something that I've liked ever since I got my first taste of it. Actually, ever since the first glance for it. But before Lagavulin 16, I didn't adore whisky that much, it was just a tasty and rough way to get hammered. Lagavulin 16 made me appreciate whisky like it should be appreciated. Same thing happened with films when I saw Trainspotting for the first time. I had always enjoyed watching movies but after Trainspotting, I wanted to explore and study them. Both, Lagavulin 16 and Trainspotting are great examples of Scottish craftsmanship. True eye openers that managed to yank me into the world of great movies/whisky. They both made me realize there's more in the industry than the ones you see every day at every shelf. You just have to look further and find it yourself. Lagavulin 16 years offers an interesting journey of dryness and smoke mixed with nice flavors without too much complexity. Trainspotting offers you dry humor in a simple storyline with an interesting way. True masterpieces of their time...alltime. Nose: Smoky right form the start. Sweet and spicy with iodine and peat. Enriched smoke turns into sweet peat towards the end. Taste: Powerful peat with hints of oak and a malty side. Smoke is there all the way but stays delicately in the background with sweet notes. Finish: Long with spicy peat and smoke combined together. Has some nutty notes and a bit earthly feel. Balance: 'Thick beauty' that manages to advance in a consistent way. Still my absolute favorite, after 60 whiskies tasted...a true benchmark from Islay and Lagavulin. Have to say that Lagavulin 1996 Distillers Edition offered even longer finish than Lagavulin 16 yrs. Otherwise it lacked in all other areas. Let me open by being perfectly honest…Lagavulin 16 is one of my all time favorite Scotches as of this writing. I have purchased it numerous times, and I absolutely love it!! I have enjoyed this dram in the summer, over a cigar at a friend’s house. Even bathed in crisp sunlight, this whisky has a solid deep amber color, and a thick, full and rich body. I have also enjoyed it in the bitter cold of winter while watching some NFL Football. (that is when you know you are a Scotch hound…when it literally becomes the exclusive alcoholic beverage of choice regardless of event) It simply works under any climate, setting, and has the great ability to accelerate a conversation. Lagavulin is an Islay Single Malt Scotch whisky and is the standard for the brand. They regularly release a 12 year cask strength variety, and a Distiller’s Edition (usually finished in Pedro Ximenez casks). There are a few others that are generally well received by enthusiasts, but the 16 is the flagship. There seems to be a slight difference in the peat influence with the ‘Big 3’ Islay’s. (Ardbeg, Laphraoig, Lagavulin) and while I think they are all wonderful and mesmerizing, the Lagavulin really does it for me. Chances are that means that I would rather drink band aids than a campfire, but either way I am thankful for the drink! Nose: Layered and deep. There is the trademark peat smoke there, but the beauty is a subtle sweetness, and the iodine (band aids) and seaweed that comes through. Showing the exposure to the coastline and the extremely slow process this spirit has gone through. I would imagine this is what Neptune’s smoking jacket smells like. Palate: Insanely complex, like a word problem with too many variables that you have to read over again. After the dry peat smoke, the substantial sweetness of berries and vanilla pass over me. Chasing after the sweetness are the sea and salt notes. Buried deep and not getting tangled with anything is the wood…as it all starts to dry your tongue. Finish: Extremely long and elegant. The peat is there, and so is the sea. The sweetness is what is so surprising. I am blown away by how consistent this flavor profile is from beginning to end. I was up camping at Dead Man's Pass near Mt. Ashland with a bottle of Lag and some cigars. My friend named Dan (from Michigan) and I were sitting there just after dusk when we saw red lights coming over the ridge to our north. We thought it was a forest fire and the only road out was due north, so we thought we were cooked. Then the lights went up over our heads and some greenish blue lights came up from the east. It was the Northern Lights on the California border! That night (1999?) they went all the way down to New Mexico in a freak sunflare incident. Needless to say, Dan and I polished off the whole bottle of scotch between the two of us and smoked all the cigars. It was a night to remember and Lagavulin made it all the better! We thought we were gonners but it ended up being a rare treat of solar fireworks instead! Back then, Lagavulin seemed a bit more polished, less harsh, and more sophisticated. I think the whisky was sometimes older than 16 years, quite a bit older. These days, some of the whisky in the bottle almost seems younger than 16 years to me. It almost seems as though there is a little young mixed in with the 16 year stuff. It's probably just my imagination but back about fifteen years ago, it seemed more mild with more depth and more happening on the palette and the finish. The nose seemed about the same, though. Actually, as much as I still like The Lag now, I liked it much better fifteen years ago. It was a more well rounded bottle of single malt scotch then, at least in my estimation. Plus, Lagavulin was way cheaper back then, even when inflation is accounted for. Beautiful review, I couldn't agree more. I now have to open this bottle and have a dram this evening.I wish it wasn't so expensive here! Lagavulin 16 is tied for first now with Highland Park 12 and Aberlour A'bunadh. Laphroaig Quarter Cask is one review shy of a four-way tie. Quick! Somebody review the Quarter Cask! Or not. At any rate, yes, Lagavulin 16 is quite good. It has a rich depth of character that is nothing short of wonderful. Is it my favorite scotch? Heck, no. Not even close. But it's quite a good dram to be sure. Right now, my favorites are Glenfarclas 21 and Old Pulteney 21. Neither is too sweet, nor too smoky. They are a happy medium for me, and although I'm not well-healed enough to reach for either of them as a "daily dram," I am quite impressed by the pair open together. When it comes to the smoke and peat, I prefer Talisker 18 these days. It's up near the top of my list. I also have a bottle of Uigeadail open, and while it's deliciously dependable, I'm really loving the austere notes of Talisker 18. Perhaps a part of my admiration comes from the fact that the T18 will be impossible to replace, whereas the Uigie can be found on the shelf only a few miles away at the nearest liquor store. Nose: Chimney smoke and grassfire together. Do I detect sherry? Oh yes, it seems so. And a touch of the iodine in there, held together with a ubiquitous hint of oxygen-rich Northern sea brine, seaweed, and the faintest trace of kelp washed up on the sand. Taste: Decadent mouth feel that coats the tongue luxuriously. The sherry comes through and then the peak really trounces your taste buds, leaving just a hint of oak on the tongue before the finish begins. Water eases the heat and the strength of the peat. Still, not too much because the punishment of this scotch is not necessarily a bad thing at all. Finish: Long and rich, oolong, brown sugar, peat, pie crust, more peat, ending with vanilla beans & a whisper of oak that reminds you of the living tree before it became a barrel. How? In essence. The presence of wood is there, but it is faint like a magical spirit in the spirits, so to speak. This one's a keeper. A great "go to" scotch for the late winter and early spring. @Rigmorole, I don't know about a decade ago as I haven't been drinking scotch that long, but the bottle of Lagavulin 16 I bought and drank last year was a good solid 91. The bottle I picked up about two months ago I would rate along the lines of 86-87, I have seen some talk about the drop in quality, and it is interesting that Ralfy reviewed the Finlaggan cask strength recently which is supposedly a variation of Lagavulin. As I have an unopened 2011 bottle in stock, I think I will hold of on another bottle of Lagavulin 16 until they get their quality back up. I hope the DE works out for you. Lagavulin 16 was better a decade ago. No, it's not my imagination. It used to taste better. The dram was more rich, deep, and satisfying than today. I recently acquired a bottle of the Lagavulin DE. I am eager to try it. I suspect it might be closer to the old Lagavulin 16 from years gone by. I will set out my stall from the very beginning. I love it! This was a early purchase of mine and I was apprehensive at spending this kind of money on one bottle. However, it has changed my perspective of value when it came to Whisky. It forged an important part of my early love and education of Whisky. The nose is very very smokey. A sweet with hint of vanilla with a waft of Arbroath Skokie. If you don't fall in love with your first sip then take another. This is the most smoke laden drink I have ever tried. It is almost over powering in its intensity, rich, thick and woody. The sherry sweetness blends perfectly and the smokey peat rolls on and on. It finishes with spicy, sweet smoke and rolls on and on with a magnificent smokey finish. Taste is fantastic, more peat, aged oak, however, sweeter with notes of sherry or berries; though not sure if this is aged in sherry casks?? A very balanced and harmonious coming together of smoke and sweet, with a long lasting finish. The finish lingers, and is complex as the peat and smokey oak dissipates and makes way for wonderful maple syrup, and floral/berry notes. An interesting dram for those seeking full flavour, balance, and a sophisticated concert of flavours complementing each other as they progress from nose to finish - Highly recommended. I am ashamed i got to write notes for this dram just the other week when i was putting it H2H with a re distilled version of it produced by master of malt (not commercial). It's a long fav of mine and most whisky lovers and peat worshipers i know. widely available, not expensive, and amazingly good. a real peat-Rex. Nose: Smoke. Pepper. BBQ. Salt and brine. Peat and leather. Cereals. Iodine. a Perfect nose, no more and no less. Islay on a tray. and no wonder this is a favorite of so many whisky aficionados. Palate: Peppery peat with sweet BBQ smoke. Leather and gum. Dry and ashy too with a lot of Cinnamon gum. Finish: Dry. Peppery. With lots of leftover BBQ smoke & BBQ sauce. Long and rewarding. a true Bang for your buck winner. delivers every time. if you don't have one, get one. period. Nose: it's like a campfire on the beach. Fire and salt, lovely combination! Taste: Smoke, peat, meat, BBQ. I enjoyed it in the beginning but at the end the smoke was a little too much for me. POP goes the cork! My expectations were very high for this whisky, mainly due to the excellent reviews and ratings it has receive. I am not disappointed! As the whisky glugs into the glass, the unmistakable Islay aroma tickles my senses. Nose: I would describe the Lagavulin 16 as a “gentle giant” on the nose. The smell of peat and smoke is unmistakable, but it is not overpowering and in fact it balances nicely with the presence of citrus fruits such as lemon zest and orange. It almost as though the peaty smoke and the citrus fruits compete for my attention, as one pulls the other back just as it gains some dominance. This is wonderful. On a further nosing the fragrance of licorice wafts up to compliment the other scents. This is beautiful harmony without any trace of alcohol. I can smell earth and dry grass, like being the unfortunate recipient of a good football tackle! This whisky is quite soft on the nose such that no burning sensation even remotely discomforts the nasal passages, something I have not experienced except with the Johnny Walker Green and Platinum. Colour: A lovely amber with the shimmer of gold. Taste: This whisky smoothly slides down my tongue like slik tickling it with a gentle but strong peat and smoke flavor that is beautifully balanced with the citrus fruits evident in the nosing. Bitter orange and licorice line my tongue and coat it with a flavor that lingers while a soft yet pleasant warmth enlivens my throat and esophagus as subtle sting serves a reminder of the 43% alcohol content. This is a very pleasant and complex whisky, with several lawyers and flavours. Finish: A wonderfully long presence of citrus and licorice lingers after an initial but gradual build up of flavor. This cannot be described as a burst or explosion, but rather a quick heightening of robust and complex flavor that remains on the tongue and in the mouth for some time. The flavor tickles my tongue, back and forth to its tip and its base. Overall: My tasting of the Lagavulin 16 reveals a “gentle giant”. It is BIG but not aggressive. The Lagavulin 16 has lots of deep and complex flavor, but I did not experience the sudden and sometimes unwelcome explosion of flavor that deadens my taste buds. The build up in flavor was quick but not immediate, thereby allowing me to appreciate the wonderful flavours of this whisky. This is a bottle of whisky that I would definitely buy again. I think I prefer the older Islay malts, which have a weakened peat smokiness and a softness that comes with age. This one has been hailed as a supreme delight by authority and amateur alike and my opinion is the same. This is one of the first great single malts I was introduced to and it remains among my very favorite. A somewhat light, rosy amber in color, the nose on this refined libation keeps shifting from wet to dry, from something like a peat-soaked chardonnay to smoke from a distant campfire; from warm wildflower honey to chocolate Necco wafers; from moist tobacco to pure dark powdery cocoa; from distant melon to a light heather breeze. The palate confirms many of these things, especially the strata of shifting, delicate layers of peaty smoke, the not-too-sweet honey and a bit of brine and spice, flowing over the tongue like ambrosial cream to a long, warm, peppery, honeyed, smooth - smooth with just a slight sizzling bite – finish. As long as I have a job, I’ll have a bottle of this in my cabinet. Color: between honey and maple syrup. Nose: I couldn't resist taking a deep breath from the bottle before I even poured a glass. The aromas reminded me of smoked salmon with something sweet in the background (my wife identified it as barbecue). Pouring it into the glass surprised me. The trademark Islay smokiness was much mellower than the Laphroaig. In fact, this strikes me as shockingly floral. There again is the barbecue my wife noted. This is meatier than the scent of salmon I first picked up in the bottle. Like an applewood-smoked brisket or candied bacon with brown sugar and praline pecans. There's a little peat in there too of course, but very light and subtle. This is a wonderfully balanced nose. Water makes it even sweeter. Vanilla and orange blossoms appear. Might this be the perfect nose? Body: full, smooth, and luxurious. Palate: Gloriously delivers on the nose. Charred sweets, like biting into a burnt marshmallow. Honey roasted peanuts. The candied bacon memory is very vivid now -- crispy, nut-and-sugar-coated bacon. I taste wood, but always sweet, like tasting the perfect barbecue sauce with a wooden spoon. This has nothing of the medicinal quality I expected. Again, the peat is present, but by no means overwhelming. The alcohol never burns the tongue. A little bit of water brings out hints of caramel, cocoa, and coffee. Finish: Long, warm, and here the powerful blast of smoke finally delivers. Billows of dark, campfire smoke drift through my mouth and nasal passages, but maple and brown sugar linger on the tongue forever. This is my Christmas Eve toast to Scotland. I hesitate to give any Scotch a perfect score, given the enormous gap in my experience, but damn if this doesn't come close. An Islay malt for the rest of us, with sweet, sugary goodness in every smokey sip. A perfect balance between the sweet and the peat. It really is too bad this goes for $95 (a painful hit to my teacher's salary), because I could drink this forever. Every human being deserves to drink this at least once, so get on with it! I figured you were gonna do a review on this, I almost wished you did. Looks like I got my xmas gift! haha So glad I see a 98 rating. This just seals the deal for me, at $114 its gonna dig a hole in the wallet, but judging from the review, you only live once! Cheers. This review is mouthwatering and very descriptive it makes me think maybe this seals the deal on acquiring this one especially since the Islay giant Laphroaig was love at first sip. That and it helps that its only about $76 around where I live. This is another stellar whisky in the long family tree of Islay whiskies. Smokey peaty arival with a well balanced long oily / viscus slow finish. This would be Octomore's older uncle. If you haven't tried this for a while the nose is pure smoke and peat at first. Consequently, I pick up prunes, ripe fruit and leather. Very nice! Taste is well rounded and smooth, surprisingly considering how powerful this whiskey is. I taste smoked honey, leather again buy less so than the nose. Some citrus that dries the mouth slightly. Finish is looong and touched with salty brine. wow! Welcome and great review especially with an Islay whisky my budding favorite region. I want to try the Lagavulin 16 and this is helping me go buy a bottle. Only reveals it self about half way down the bottle. It's waited 16 years so it needs some time to open, but it's well worth the wait. Nose - Not the best nose, but this is deceptive. It's rich and warm. Tobacco with orange and flowers. Quite fizzy but wood notes tame that. Palate - Big wash of salt first and a little oily in the mouth. Barley sugar then the old oak and pine furniture rush in followed by the peat, honey and heather. Finish - is minutes long. pushing the air from the mouth out through nose you get layers of spicy, sweet, sweet barbecue smoked meat and fish meshed with medicinal sea side goodness. It ends finally with a numb tongue that feels like it's been treated with tcp. Then the sweetness and wood returns to leave you with a lasting sense of umami. A truly complex and rewarding drink and worth every penny of it's tag. It really does improve as the bottle gets lower. Delicious, wonderful whisky! Does it get any better? Well, possibly the Laga 12 and some Ardbegs, but this is a fantastic whisky! I read Serge at Whiskyfun say this is one he goes to when in a bar and I agree. One to always have on hand! So far i have tried the Talisker, Dalwhinnie 15yo, glenkinchie 12 and cragganmore 12 and have enjoyed them all with the talisker being the stand out so far. Now its time for the Lagavulin 16. My first single malt scotch was laphroaig 10 and so far my only heavily peated scotch so i was a little nervous about trying this one. First time i notice is the color, nice and dark and very inviting. On the palate the peat and smoke continue but not in an over powering way, i also get salt and pepper. Finish: nice and long with the smoke still hanging around and the sweetness coming back. Now the first 3 bottles of his collect I just recently reviewed. The Macallan 10 yr old Sherry Cask, Sazerac Straight Rye Whisky and Johnny Drum Private Stock Bourbon. Next on the block was the Lagavulin 16 yr old. Now I'm excited to try the Lagavulin because I've heard awesome things about this distillery and especially the 16 year old. Now to be honest I am not a peat head. I'm not a smoke nut. I prefer my whiskies nice and sweet. Now to also be fair and honest it's rare when I encounter a whisky that I don't enjoy on SOME level. As I've had Ardbeg I was eager to try the Lagavulin and this review is based off tasting notes from last night and this morning because he left me a dram of both this and the Ardbeg! My first taste of this is charcoal, strong charcoal coming through. Ashes follow. Hints of iodine are coming through on my palate. It's a bit of a sea breeze with salt and brine on the tongue, with some small amounts of sherry following it all. But the peat and smoke dominate. Now if you're not a whisky drinker and you're reading this you'll probably wonder why in the world someone would drink something that tastes like charcoal and smoke and iodine. The reason is simple my friend. It's FUN!! The finish is lots of peat, smoke and some medicinal flavors coming through on the tail end are some spices and a bit of the sherry. This is a REALLY good whisky. I'm not a HUGE Islay fan, but when I'm in the mood for something smokey I'd love to crack open a bottle of Lagavulin 16 yr old. From the notes you might be thinking that this sounds disgusting. It's not. This is a wonderfully balanced whisky with just enough sweetness coming through to cut the smoke and peat and iodine to a lovely level. At roughly $100 AUS bottle this is a steal of a deal and if you're like me this bottle will last you a good while and is more then enough to satisfy your yearning for something smokey and complex when the normal speysider just isn't doing it for you! Awesome review, 'SquidgyAsh' (and a great series of reviews for that matter)! Your tasting notes dovetail with my general impressions as well, to a large degree. If you are able to get a bottle of this, do so! One of the things that has impressed me about this bottle is that a new aroma or taste seems to appear almost every time I have had this. Pine needles and orange have been two of the more noteworthy outliers. I have also noticed that over time (my bottle has been open almost nine months), the strength of the smoke dissipates (fortunately, it does not disappear altogether!) and is gradually replaced by the sweetness from the sherry. While the overall power of the whisky is lessened, you may find the taste profile even more to your liking! BTW, $100 AUS is (relatively speaking) a good price, as here in Ontario (who along with Australia and British Columbia seem to be the most expensive whisky jurisdictions in the world, where there appears to be a good sized whisky audience) the bottle currently goes for $110 CAN. Thanks Pudge! You know the last few Islays and Vatted whiskies with a heavy Islay mix seem to open up very nicely after a month or two after the bottle has opened up with some lovely sherry notes (in my experience) shining through. One of the things I'd noticed and was very surprised at was how strong the Lagavulin tasted vs the Ardbeg. Mind you the Ardbeg had been opened for a minimum of 6 months and the Lagavulin had recently been opened. I find it so sad my friend that Canada and Australia really suffer on the high alcohol prices for our whiskies (and other spirits to be fair). It doesn't seem fair my friend. I'll be sure to snag a bottle as I can, but I'm currently on time out after spending all my whisky money for the next 6 weeks on a bottle of Macallan 12 yr FO, Glenlivet 12 yr old (don't buy this one), Balvenie 21 yr old Port Wood and a bottle of Glenmorangie Sonnalta PX. I passed on the best wishes to my wife and she says thank you kindly my friend and that she won't touch the Lagavulin again hahaha! Having crossed paths with many glowing reviews of this expression, I finally got myself a bottle to taste. Throughout my adventures with the water of life, I seem to lean more in the direction of the smoky than the sweet with a few notable exceptions like the tantalizing Aberlour A'bunadh, for instance. I was not expecting the sickly balance that greeted me with this Lagavulin and although I am glad to have experienced this 16 year old Islay, I will probably not purchase again. Let's be clear; this does not strike me as an inferior whisky. There is a well-roundedness that permeates from all angles. I can see why some do enjoy this dram but for me, the flavor profile mixed in here is not enough of a standout to keep it on any short list of future joys to be had. On the nose, there is a sense of old musty rose petals, a slight hint of cedar, and, well, a fog. In fact the entire intake is quite foggy indeed; lifeless and unremarkable. Taste: Reminds me of an A'bunadh, only without the fun. The arrival is quick with a slight burn, but the overall density never really develops into anything interesting. Normally, With time (about 1 minute per year of the age statement) and a drop or two of spring water most drams I have experienced to date evolve into a more pure version of themselves. While it does seems to lighten up a bit, sadly the expected evolution never actually takes place. The finish is as stifled as it is medicinal, with a maudlin sweetness that lingers like a cough syrup aftertaste on the tongue. My issue with this bottling was mainly the sickly sweetness and the general malaise within. I love me some peaty goodness (Ardbeg Uigeadail and Laphroaig CS are my top 2 all time), but I hardly noticed it in this dram, to be honest I wouldn't even list that as a feature. The Lagavulin 16 is quite dim overall with nothing to hold my interest, and I would not invite it back to be a recurring shelf dweller. While this flavor profile is not for me, some may enjoy it and more power to them :) I have experimented with quite a few bottles myself seeking my own preferences and thankfully most have met me with open arms and agreeable palettes. Sadly, This Lag16 did not. Personally I didn't find it so disappointing. It started to disappoint me from half bottle empty. It suffers the time passing a lot, but maybe not more than others. What I found as disappointing as the Laga16 you've reviewed is the so appreciated Talisker 10yo. What an awful dram! one of the strongest smell and taste with the peat in the whisky of Islay. comfortable! This one never ceases to amaze. Every time I decide to venture down this path I experience something new. A beautiful nose exquisitely balanced between slightly salty and deliciously sweet. But the king in all of this is the delicate peaty smoke that holds everything together. The palate is like discovering poetry for the first time. First comes the barley shrouded in honey and then a deft smattering of almonds. Delicate spices dance a little dance at the end as you get introduced to nutmeg that is softly brushed with caramel. If there was a dram that I would ask for at the gallows this might be it. Just bought a bottle of this today and enjoying a couple of neat drams this evening.... a lovely blend of Islay peat, creamy vanilla, white pepper, flint and nutmeg, great finish.. a lot going on here and more to discover I'm sure in the coming weeks. Lagavulin is one of the big three on the southern side of Islay known for their peaty/smokey character, the others being Laphroaig and Ardbeg. Founded in 1816 by John Johnston, it is now run by Georgie Crawford formerly of Talisker and she seems to be doing a great job with the whisky being bottled right now. nose... big smoke! peat shines through to smoke an a wonderful earthy briny note. powerful sea breaze gives a great accent to the sherry notes that are hidden beneath. palate... peat punches the tongue, with some more smoke. brine and earth. a fresh breeze off the Atlantic in the fall, with solid rich sherry notes present, raisins, hint of dark chocolate(maybe?). full in flavour still small hints of iodine push through it all. finish... more peat and smoke. some ashy remnants of last nights fire. long and drawn out, burning warmth takes hold and feels great being January. there is a slight alcohol burn but it's a welcomed feeling. This whisky is a classic. No question about it, it has lasted the test of time, tried and true to not only loyal fans of Islay but often times the perfect introduction whisky. I almost felt this review was sort of superfluous, but hey why not just add to the pile before me. My final opinion of this whisky, amazing. There are no two ways about it, the 16yo is one of my "go to" bottles. Doesn't matter the day, time, mood or place I never turn down a dram of Lagavulin. I will warn any reader, if you are not into peat and smoke try at your own risk. It's worth trying but easily not for everyone. As far as I'm concerned, this is the pinnacle of Islay scotch. What makes it great is that it's more than just smoke and peat. Of course, that's not to say that smoke and peat aren't present in abundance, but that they're backed by lots of other really great scotch notes. You of course have the standard Islay notes on the nose and through the body: peat smoke, salt, ocean air. But you're also getting notes of caramel and vanilla, and even a little bit of oak. It thus winds up being a much more versatile bottle than, say, the Ardbeg 10yo. While that scotch and this one go toe-to-toe as regards smoke and peat, the Ardbeg pretty much stops at that point; the Lagavulin keeps going for quite a while. Highly recommended. If you don't like peaty scotches, this might well be the one that convinces you. If you do like peaty scotches and you haven't had this one yet, you really owe yourself a bottle of this. Where do I start? I really can't put into words how amazing this stuff is. I have been a whiskey obsessor for a while now, and I work in the industry, so have had a wide range of flavours on my palette. Lagavulin. One of my favourite words now. I was working at my bottle shop for about a month, and throughout that time had been talking to my manager about whiskies that we both loved... Every time we had this conversation, he wouldn't shutup about this thing called Lagavulin. I had never heard of it before. So, after weeks of him nagging me to try it, I forked out the $120 AUD for it and took it to a mates place that night to enjoy it while his little brother and friends ran around getting drunk at the great age of 16.
pulling the bottle out of the box, you can tell it means serious business. It just looks boss. Open up the awesome cork, and you get this powerful amazing smell.. my mate dubbed it "smoked meat." And after thinking about it, he's probably right. Think of a beautiful smoked dinner, it has that sort of scent. They say the best sense that is linked with memory is scent, and all i can think about these days is the smell of Lagavulin 16. poured some into a glass, had a whiff, drank some, and i was instantly blown away. my mate still recalls the face i pulled when i had my first sip. honestly, if you are new to the game, or even a veteran, just go out and buy this, it will blow you away. Thank you Lagavulin for creating one of the best things i have ever tasted in my life, and that goes for food and beverages, this is just a stunning beverage. What a fantastic review. I haven't tried any Islay Scotches yet, and it is really, really appealing to me. My birthday is coming up in a little over a month, and I will be going to a bar that has 107 different Scotches. Lagavulin, Coal Ila, Laphroaig,and Ardbeg are a few Islay's that are intriguing me. Thanks for the review! Lagavulin 16 might just have to be my first birthday dram. mmmmmm i like the sound of this! might just have to give it a try in the coming months! If you don't like Lagavulin 16, you don't like scotch. Nose of smoke, the ocean, salt, and wood. This smells like a bonfire at the beach and tastes like it, too with smoke and sea salt on the palate. sipping this is reminds me of eating raw oysters. the finish is as long as anything i've ever experienced. You'll have to wash the smell of Lag 16 out of your clothes if you have more than one glass. Final Analysis: this might be the perfect whisky. All others will be compared to the enjoyment I get from a glass of Lag 16. Plus, every once in a while, my local CostCo sells it for about $50. I have had the Lagavulin 16 a few times now. I finally recognized its brilliance and balance... This is truly a stellar dram and is easliy one of the best whisky's to hit my nose and palate. Wow, everything about it is well balanced, perfectly palated and draws to a nice long smoke and light oak finish. A bit of brown sugar on the palate after you savor the primary tastes of seaweed, smoke, light peat and slight lemon-grass. I last savored a couple drams before and with some fresh, raw oysters and was absolutely in heaven!! THIS IS A MEMORABLE WHISKY and will usher in the Autumn season well. Nose: Less peat and smoke than the 12, but certainly not subtle, green tea, charcoal and wood chips, pine needles, sawdust, bitter mint, some brown sugar, highly unripe strawberries, bandages. Taste: Bitter lemon, peat, salt and pepper, sea water, ash. Finish: Peat, lemons, cooling mint, an extinguished campfire. This was my first Islay whisky and wow did I hate it back then. I ordered it at a bar shortly after beginning my whisky journey and was stunned by the vile nature. I couldn't bare to finish it........Strange how things change. I remember very clearly thinking about that medicinal peaty flavor for weeks afterwards and I became more curious. Fast forward to now, and I have 3 bottles of Lagavulin in my cabinet. The point of the story I suppose is, don't write off a whole group of whisky (or anything) based on a single first impression. You could end up missing out on something great. A whisky of great beauty and power. The strength of the peaty, pungent smoky taste and smell is not something you'll forget and something to savour. If you want a full whisky drinking experience this has everything; the combination of colour, smell and taste are superb, complimenting each other perfectly. This may not be an everyday whisky but when you want that smoky goodness, it will never let you down, making the Lagavulin 16 an essential whisky to keep in the collection. Nose: At first, nothing but spicy iodine and salt. After about 10 minutes it morphs into sweet chocolate and caramel apple notes. Palate: Very well balanced, smooth body. Salt, a hint of wood as it coats the tongue, moving on to sugar-coated lemon and butterscotch as you swallow. Finish: warm lingering, sugary caramel. My first experience with this wasn't so good. I tried it at a particular bar along with Talisker 10; rather disappointed with both. Not sure if my palate was on strike that day or what. That being said, I like to give any whisky a second chance (as I well know tastes can change day to day). At first the peat and the phenol are immediate, but after letting it open a little, the sweetness and woody character come through. Citrus and vanilla slowly fade in and given long enough, brown sugar develops. Hitting the palate, the warm peat kicks things off. Pepper, vanilla, a slight creaminess, and subtle fruit follow at a fair pace. The intriguing thing about this malt is the body; it's ridiculously smooth, given the weight of the nose and the palate. I think something rather special is going on there. The finish isn't too long but it fades out with a fresh salty and vegetal presence. Overall, I'm very pleased I gave this one another chance. It's quite an elegant malt and the silky body provides a beautiful juxtaposition against the strong nose and palate. Wonderful! As a new whiskey drinker, I decided to add this highly rated drink to my cabinet. I hadn't tasted any Scotch that had peat and smoke in the mix before. Whew! I guess I was a little overwhelmed with the taste. It started out with just a little peat and smoke, but then built to a smokestack. I can't say this would be an every day sip, but I can see how an experienced scotch drinker would love this. Didn't get much from your review I'm afraid. However your warm friendly sense of humour comes through! If peaty Islay malts were a social click, Lagavulin 16 would be the snarky intellectual of the group. This malt has all of the characteristic peaty punch, but with a refinement and delicacy that some of the others (I'm looking at you, Laphroaig) don't even attempt. The first thing I noticed was the color. I usually don't spend much time dwelling on the color of my whisky, but the Lagavulin 16 is really striking in its luminous amber color. This is easily the most beautiful malt that I've seen to date. The nose has a definite and delightful smoky aroma, and the first taste matches that perfectly. The taste leans more towards the smoke end of peaty, and less on the earthy side. There's also a bit of saltiness. The smoke then parts to make way for a lovely taste of dark chocolate. The finish has a nice bite to it, but isn't overwhelming. The taste lingers and warms and the smoky flavors return. Overall, I really enjoyed this malt. I still think I prefer the complexity of Ardbeg Uigeadail, but this one has an elegance that I appreciate, which is really quite an accomplishment for a heavily peated Islay malt. When I first became interested with SMSW, I came across an educational whisky blog (Malt Madness) which provided me with a lot of insights and guidance. One thing that jumped out at me was the story by the author, Johannes van den Heuvel, and how, back in 1991 he first became introduced to Scotch and how his first taste of "the water of life" was Lagavulin 16. He has been hooked on SMSW ever since with special sentiment towards Lagavulin 16. His experience certainly peaked my curiosity and I knew I had to try this special malt. With all these flavors going on from start to the literal finish, your senses take you from the beach to the smokehouse and back again with plenty of scenery in between. Taste testing review performed while watching the 2011 Chicago Cubs Opening Day game (so I have plenty of time to enjoy the dram[s]), in a 12 oz. snifter, hand warmed, lot's of nosing. Nose: Amazing how many flavors come thru; ocean saltiness and sea foam, seaweed, shore side smells of decaying crustaceans, tobacco, ripe fruit, smoldering peat, old leather, whiffs of Bourbon & sherry?. Palate: Like chewing on a burnt wooden stick coated in sweet oil, wet leather soaked in malt, dried citrus rind. Finish: Slight bitter sweetness giving way to the sugared peat which hangs on for a long, long ride, undertones of some black licorice, old dried out fruit lightly salted. Balance: A smokey, well balanced complex dram indeed. Plenty to pick apart and identify over time. Warming opens up many layers of flavors. This whisky is truly a favorite. Like a good "nine inning cigar", saddle yourself with a couple drams of Lagavulin 16 and this is the "nine inning whisky". Take your time with it and enjoy "the game". Go Cubs! Lagavulin 16 is the one that truly got me from 'curious/interested' in, to 'committed' to, the whisky journey. If you haven't had it before...do not wash our your glass...the smoke lingers in the glass for hours...simply awesome! Go Cubbies!, Great Whisky also! The first whiff of this is big and peaty, just like you would expect. But it's not the raw charcoal peat of most younger Islays. There is a smooth, even sweetness here. Sticking your nose in this glass is like sitting next to a fireplace fueled by apple wood, pleasant and warming. The taste is like high quality cocoa. It is big and buttery but with the slightly bitter edge of dark chocolate. This dram may be smooth but it is not shy. It coats the mouth and fills the nose. It is big and bold, almost too rich for my taste. But it goes down so smoothly I can't help but go back for another. WARNING: NOT FOR THE BEGINNER. Strong smoke and peat. A huge nose, like Rocky Balboa, will knock you back, but in a very good way. I love the smoke. Think of being engulfed in the BBG pit with a big strip steak. Beneath the smoke, I pick up the luscious dark fruits. I let it simmer in my mouth where the flavors explode; thy fruit, thy salt, thy alcohol. Each flavor and expression says "Here I am", kindly giving way to the next. Perfectly arranged and balanced...Beethoven is in the house! And the finish...what a long finish!!! It's like a 100 point Brunello di Montalcino (a 2001 Casanova di Neri), but longer. In 1967 Ernie Albert and ZaZa Gabor gave us "Green Acres is the place to be." In 2011, Islay is the place to be!!! I give it 99s point, in honor of The Great One. I first sampled this as part of an Islay flight, presented with Laphroaig 15 yr and an expression of Bruichladdich. The complexity of flavors and scents in this Lagavulin whisky blew me away and I've been hooked ever since. I'll probably possess a bottle of it until the day I die. Not my favorite Islay, but the woody nose and smoked meat taste was rather unique and enjoyable. This was one of my first whiskies I ever bought older than 12yrs. In addition, it was the first bottle for which I paid $80 or more. I wanted a good example of an Islay, and after reading so much about this whisky (both online and in M. Jackson's book), I knew it was the one to get. I have nursed this bottle for nearly a year, and have enjoyed it over and over. I decided it was high-time to write a review of the whisky (before I finish it! ), so here goes! Nose: SMOKE! PEAT! Salty sea-spray. Warmth, and subtle hints of flora. This is the whisky that my wife says smells like FIRE! One night, I was drinking this wonderful dram and she starts asking if I smelled smoke (while looking around the house for a source of the inferno.) I say, "no, but I'm drinking a pretty powerful dram, so I probably can't smell anything." At this, she tells me to come closer and say something else. She found the source of the inferno...my breath! To say this whisky has an aroma is to say the Grand Canyon is a crack in the ground. In addition, if you're a bit stopped up, a good whiff of Laga 16 will open up those nostrils for sure. M. Jackson stated: "More sherry", which I assume means he smelled a good bit of sherry in this whisky. I did not pick this up from the nose. Body: heavy, rich, full-bodied whisky. I can almost CHEW on this dram! While I wouldn't call it smooth (although M. Jackson did), it is in fact delicious, which makes it easy to drink. Palate: BIG PEAT and SMOKE. Building in intensity with the peppery spices. If your nostrils weren't sufficiently cleared by the aroma, they are now! There's more in there as well, but goodness if I can't discern it. I'm tasting apricots, marmalade, and spiced apples. The whisky isn't exactly sweet, but it has the hint of sweetness. The flavors are as though the sugar has been cooked out of it, but the base flavor remains. This monster has been meticulously balanced to deliver an incredibly WARM taste. I am sitting by the campfire, I have finished a wonderful spiced apple cobbler. The flavors are still on my tongue as I pull back on a maduro cigar. I am downwind, catching a face full of smoke (both from the fire and from the cigar). This whisky encapsulates this experience for me, which brings me to a place where happiness ensues. If you don't like campfires, smoking cigars, spiced apple cobbler, or whisky, then stay away from Lagavulin 16yr! M. Jackson talks about the "sweetness of the sherry character," which I suppose was the flavor I was calling marmalade, apricot and apple cobbler! Finish: The peat comes back, with some of the spiciness, as the dram warms the chest on its way down. M. Jackson said this about the finish: "Huge, powerful, peaty, salty, embracing." I think that just about says it all. Well said. An excellent one. I would maybe even go so far to say this one defines the word whisky to me ... so far, as I havent tried all of them ... yet :-) It hits you right in the center of the brain. Almost every friend of mine that tasted it disliked it. No problem, thats just more drams left for me. This is a review for the 2009 bottling of Lagavulin 16, which I like a little better than my previous 2006 bottling. Nose: Great balance of peat smoke and sherry flavors (dried fruits), with some iodine in the mix. The sherry isn’t strong, hinting at mixed and/or refill cask maturation, but the overall effect is a rich one. Finish: Very long, with continued drying on the tongue, along with some sweetness. Peat smoke (leaning more towards coal smoke now) and dried fruits linger perfectly in the back of the nostrils. Comments: My 2006 bottle had more caramel, to the point where it almost got in the way at the end. This 2009 bottling is more balanced. A true classic, and one to always have in the cabinet. The Lagavulin 16 Years Old is an enchanting antique gold colour. It is also particularly powerful in flavour, not uncharacteristic of Islay whiskies. As I type this, the thistle glass is sitting about two feet away from me (with a lid on!) and I am still picking up strong smoky, chemically aromas. As above, the nose is extremely powerful, with smoke and iodine. The smoke is definitely wood, rather than coal and there is a hint of burned gunpowder. After the fire and chemicals, more mellow notes arrive; vanilla, sea-water and a little heather. A deep-filled apple pie with demerara sugar on top and crème Anglaise follows in the end as the nose sweetens up. The initial impact on the palate is mellow, cream and fruit jellies. This is followed by a big, bitter smoke and high-cocoa dark chocolate. This fades slowly and leaves behind a bitter, salty iodine-soaked wood and the smallest hint of vanilla again. The mouth is a middling viscosity and the flavours do manage to get into every corner, the finish is exceptionally long and woody. The nose loses a lot of the fire and iodine, leaving behind only sweet apples and a little pear with toffee and custard. The palate is spoiled entirely by water, thinning the mouth-feel, although generally leaving the finish unchanged. The main element in the palate now is damp, wood. Lots and lots of wood. There is a little heather, cigar smoke and vanilla, but generally just wood. It's been a while since I've pulled this out of my whisky cupboard and I was a little disappointed. Perhaps I've built it up romantically in my memory as something it could never live up to, but there was less happening flavour-wise than I expected. Still, it's a smashing dram in spite of this. This is a good scotch. I enjoy every moment of the taste and smell it brings. Let it breed a litle for much more pleasure! The finish is astonishingly long and revealing. This is perhaps my favorite Islay scotch, and I've had quite a few. I'm not sure what exactly brings me back to the Lagavulin time and again, but I think the best word is balance. Certainly, this is a peaty scotch -- don't get this if you're not a fan of the heavier Islay malts -- but there are peatier (the Ardbeg 10, for example). And there's heavy oak flavor along with a faint sweetness at work here, too, which balances the flavor and makes for, overall, what I find to be a much more enjoyable and rounded scotch than something like the Ardbeg. Worth every dime -- if I'm ever a bit more flush with disposable income, this will become a standard cabinet-stock bottle for me. Taste : Starts with very dry peat smoke followed up by mineral salt and touches of wood. Hints of sweetness come though then a long complexed finish almost like coal. This whisky epitomises everything about Islay whiskies. It is the bold statement of a wave beaten shore that begs to be either loved or hated. Definitely for those that enjoy a big, powerful whisky. Lagavulin has the strong peat smell. it's very good for me to have this. i love it..
45? this must be a mistake! And here I was thinking that heavily peated whisky wouldn't be to my liking yet. But this Lagavulin made me see the light! After several careful encounters with Laphroaig and Ardbeg, I now tasted this Lagavulin 16 Year Old (that I got as a birthday gift). The beautiful dark color and intense viscosity get your anticipation levels peaking. The nose is very powerful with a truckload of iodine and peat, with quite a bit of salt. Close your eyes and you'll find yourself on the shores of Islay during a storm! Easy, baby, easy... I'm new to this. Several gentle sniffs bring out the subtler nuances with some vanilla - that was not expected! Great nose! You do not want to dillute this baby, believe me. The dram is deceptively silky and coats your mouth completely. But... what is this? It starts with sweetness, even chocolate? That's not what I got from the nose. What is going on... But then - ah! The dram explodes in your mouth (you will actually widen your eyes in surprise, I know I did) with the peat, smoke, iodine and salt. Oh, yes! What a complexity. I love it! I can only add five more words: you must try this one! Lagavulin 16 has long been my "every day" whisky, ever since that first sip. I'd have to agree that its not what it used to be -- I remember opening my first bottle and setting it on the table only to return a few minutes later to a room full of a "smoky campfire on the beach" scent. I think the aromas are more tightly held now, but its still a wonderful dram. And, for me, Lagavulin was a gateway whisky -- I now enjoy the more heavily peated stuff, specifically, the brands you mentioned. Well, glad you enjoyed your first Lagavulin. When you're ready to dial up the intensity, give the 12yo a try. cheers! Just cracked my first bottle of Lagavulin 16. I was dubious, after the Laphroig 10, (which I enjoyed, yet noticed had a strong peat and smoke flavour to it) whether the neighbouring Lagavulin Distillery would produce such a heavily peated Malt. I had read great reviews, and upon dreaming of being Ron Swanson from Parks & Recreation, I went out and grabbed this dram. And boy, am I sure glad I did. This is such a complex and smooth Whisky, with a smokiness that lingers, but does not intrude. Still maintaining that Islay peat, it is more subdued than the Laphroig, and hangs around in the back of the throat just nicely. This is a well balanced Islay Malt, without any notes overpowering any others. I am certainly not an articulate Whisky Connsr, yet I can say without a doubt, this is the best Single Malt I've had to date, and has become my favourite Whisky on the market. This will be my 'go to' Single Malt until something else triumphs it. Mouth: smoke, earth, little watery at first, almost silky (a little sweet even), explodes afterwards, this really is in contrast with the nose! Finish: chocolate, walnuts, very clean, a little bit of burnt wood ... and then it takes all the moist out of your mouth. Nice review! I love Lagavulin! The first malt I fell in love with. I bought the distiller's special edition when I was there, and I didn't like it as well. It was sherry-finished which diluted the greatness for my tastes. Just an FYI. "Smokey and explosive!" How right you are! This was my very first intro to scotches and I liked it. However, I was handed a tumbler with a little ice in it since I was a "Scotch Virgin." Had it right before "Cadillac Fajitas", a Lobster and filet mignon version of the Mexican treat. A perfect prelude! Since then I bought a bottle, drank it neat and am always amazed at the "explosion." Smokey. Forest fire. Colour is a light copper and full bodied. Flavours are walnut and raisiny fruit completely coated in peat and smoke. The nose is deep and powerful. The initial hit is huge peat plus iodine. After a few sniffs, a bit of vanilla and some fruity sweetness starts to come through. The initial hit for me is the reverse of the nose. An initial sherry, vanilla sweetness that is quickly swamped by a salty, iodine punch to the face that swarms with strong smoky peat. It leaves a dry warmth at the back of the throat, but leaves my mouth and lips watering. The finish continues with the peat, smoke and iodine, but as it fades, it tingles with a hint of spice which starts to dry my lips. A truly great malt! When I first started drinking whiskies, I made the mistake of buying malts in this order - Glenfiddich 12year old, Glenfiddich 15 year old then Lagavulin 16 year old. I can remember opening the bottle and thinking what the f@#$ had I spent my money on! Then I had a sip and was smashed by the peat and the iodine, and my reaction was 'what the hell is th....' as the finish kicked in silencing my sooking. It took a couple of drams over a couple of nights for me to get over being punched in the face by the peat and iodine before I started to get the subtler flavours. Drinking malts in that order is not a strategy I would suggest for others, but it is now one of my favourite malts and should be a part of any discerning whisky lovers cabinet. This is a great review. I also started gentle, with The Macallan 12 sherry oak. It was soft and gentle, then I tried the Macallan 15 fine oak, spicier, but still refined, then I stumbled upon the Lagavulin on my honeymoon. After 2 drams over 3 hours, my new wife was vying for my attention! My favourite dram just edging out Laphroaig 15. Haven't had the pleasure of the Laphroaig 15 yet, but it is in the wishlist! Lagavullin is like all islay peated and smoky. It has a nice strong finish. 75????? WHAT???? Yes it is peated. Yes islay malts tend to be peated. What is missing here is how it differs from those other peated offerings which are each distinct in themselves. This is my absolute favourite everyday whisky. This is the standard to which every new sip of whisky is compared. I must concur! I bought a glass on a lark, after being encouraged by a review on liquorsnob. It was the strongest nose and taste I had ever had. Shoe leather, I'd explain, but it goes down smooth and permeates. My absolute favorite so far! This whisky takes no prisoners and is not for new comers. This is possibly the most powerful smelling of all the quality Islay malts, so much smoke and heat and a lovely hit of salt. Drinking this neat is a revelation the peat and salt is prevalent of course but there is a definite hint of chocolate truffles and a sweet chilli finish. The reason I enjoy this so much is that although it has a bite and a bit of a rough edge is has the complexity you would expect from a 16 yearold, best of both worlds really. One of the all time classics of Scottish Whisky, I don't even know why you're reading this review, get out there and taste it for yourself. There is a lot less hype about Lagavulin than the other big hitting Islays, but I think Lagavulin has just as much character and I like the fact it is understated. I tried the 16 yo in bar a while back but haven't owned a bottle. I would like to revisit to savour a few more drams. Faint smoke aroma with pronounced caramel. Sweet flavor, slight warming burn then a mellow smokey sweet finish. The 16 Y.O. Lagavulin is defenitly my favourite. I wouldn't describe the aroma as 'faint smoke' btw. The some arome is really stong as is the iodine level, which in my opinion makes this a great choice. I suppose it's all relative, I was tasting it with some some Laphroig that, by comparison, was definitely 'smokier'. Point taken though. A Drop of Lagavulin is like a bite in forrest floor. Marvelous! I have no idea what that means, but I agree! Ah. Good to be home?